Small Estate laws were written to allow heirs the right to receive property from the deceased without having to go through the long process of probate. A Small Estate Affidavit is used to transfer an estate to the rightful beneficiaries. Search our online database for your state-identified, free Affidavit of Small Estate form here. In many states, heirs can shorten or even avoid probate under certain conditions. A Small Estate Affidavit is useful for quick access to the deceased’s bank accounts and securities to pay funeral costs. Depending on the size of the estate and the state where you reside, you may qualify for an uncomplicated procedure for heirs of small estates. This procedure involves the use of a Small Estate Affidavit. A Small Estate Affidavit is a sworn statement signed under oath by an heir or heirs of an estate that the estate’s value is worth an amount small enough to avoid or shorten probate. Using a Small Estate Affidavit is a much faster alternative when compared to the probate process and allows the heirs access to the assets of the estate quickly and with less paperwork. The Small Estate Affidavit should be prepared by the executor of the Decedent’s will or the person with the most knowledge of the deceased’s assets. If the Decedent dies without a will, then the spouse and heirs must prepare the Affidavit. A Small Estate Affidavit is used to inform a probate court that a particular estate meets the requirements of a certain state’s small estate laws. Small estate laws vary by state, but most states cap the range in value from $1,000 to $150,000 in assets and that more than thirty days or more have passed since the Decedent passed. The Small Estate Affidavit is filed in the Probate Court where the Decedent lived at the time of death. It can also be filed in any county that the Decedent owned real estate. The Affidavit informs the Court on the value of the deceased’s assets. Once the Affidavit of Small Estate is filed, the Probate Court issues an order approving the Affidavit and transferring the property to the heirs. The name and address of each surviving heir and their relationship to the Decedent. A list and description of each asset to be distributed with its fair market value and the name of the recipient. If the deceased died with a valid will. A copy of the Decedent’s Death Certificate and Social Security Number. The executor then gives notice to all creditors of the deceased and may immediately start distributing the assets. 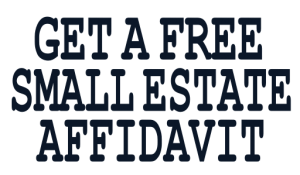 Fill out and print your free Affidavit of Small Estate form online. When leaving assets to your survivors, you may think that your estate is too large for your heirs to take advantage of Small Estate laws. In some states, if the value of your assets is larger than the Small Estate dollar limit, your heirs may be able to go other routes to avoid or shorten the probate process. You have to plan in advance and research your state’s laws because there is a good chance that your estate may qualify for Small Estate status. In some states, assets may be listed as different types of property or, even, omitted in the process. A little due diligence and research may save your survivors money and time during probate. Choose your state from the list below to find out more about Small Estate limits for your state and more information about how to fill out Small Estate Affidavit forms.